Consistent with our commitment to nurture young Baptists, Winter Youth Summit is a biennial, collaborative youth discipleship event among CBF Georgia, CBF Alabama, CBF Virginia, and CBF Tennessee. 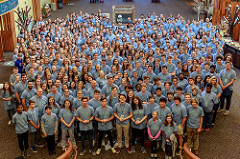 Most recently hosted by CBF partner congregation First Baptist Church of Huntsville, Alabama, this regional three-day, two-night event engages youth in worship, formation, learning, and fellowship across state lines, encouraging them to embrace a life of service and Christian commitment. In 2020, the event expands to dual locations in Huntsville and Charlottesville. Plan now to join us for 2020! For more information, contact Rick Bennett at rbennett@tncbf.org or check back here for updates on WYS 2020.